BAGHOUZ, Syria — The collection of tents was largely silent on a sunny winter Monday afternoon. Few people were visible, but the few out and about were calm: Two men in long robes and pants walked slowly together through the grass, a woman leisurely came out of her tent to look around, a man on a motorcycle drove toward the river. This is the last speck of land held by the Islamic State group — a patch along the Euphrates River in eastern Syria where an estimated 300 militants are mixed in with hundreds of civilians, refusing to surrender and trying to negotiate an exit with the U.S.-backed forces surrounding them. An Associated Press team got a rare glimpse of the IS-held settlement, standing on a rooftop about a kilometer (half mile) away during a media tour to the front lines organized by the Syrian Democratic Forces. The roof looked out over a flat, green landscape with scattered palm trees, to an earthen berm and a line of pickup trucks put up by the militants at the edge of the camp. At one point, gunfire crackled in the distance. 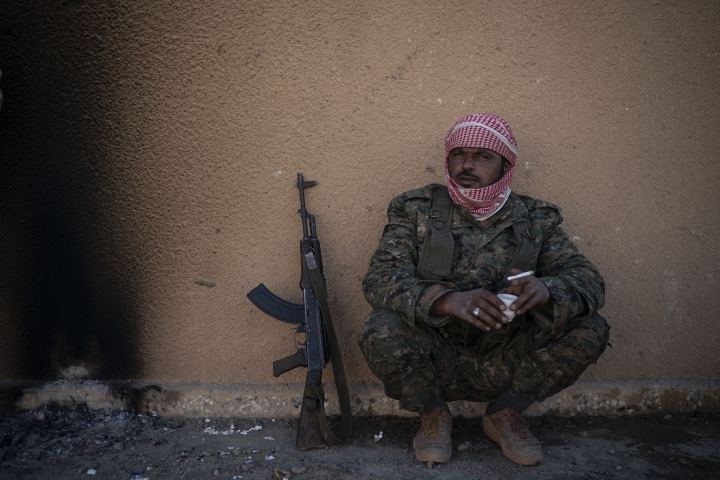 An SDF commander on the roof with a number of fighters said it isn't always so quiet. Only days earlier the militants surprised the soldiers with an attempted night raid. 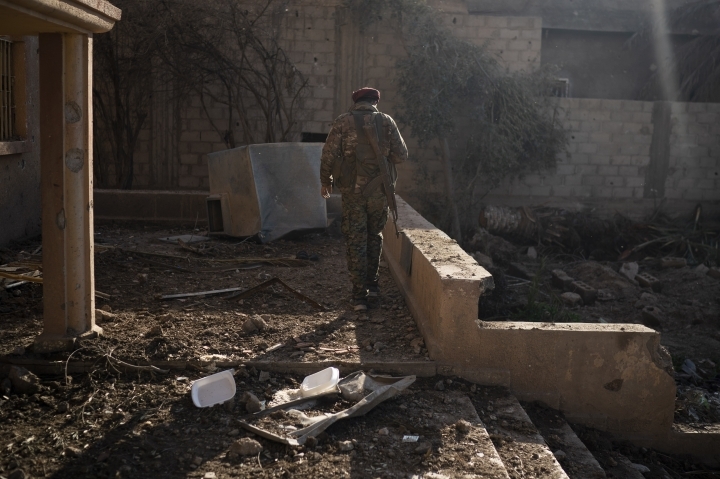 The SDF can't assault the site or call in airstrikes because of the civilians, he said, adding that his fighters have seen the militants moving civilians around at gunpoint as protection. "They try a psychological war. But that is it! 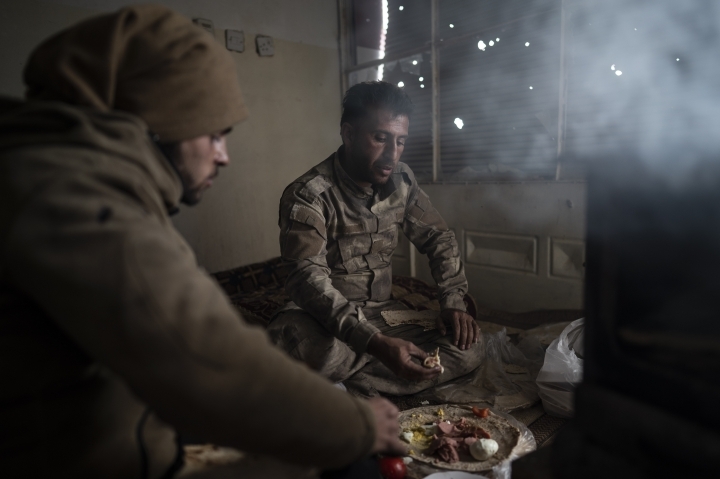 The war is over, and we won," said the commander, who spoke on condition he be identified only by his nom de guerre, Baran, in line with SDF rules. 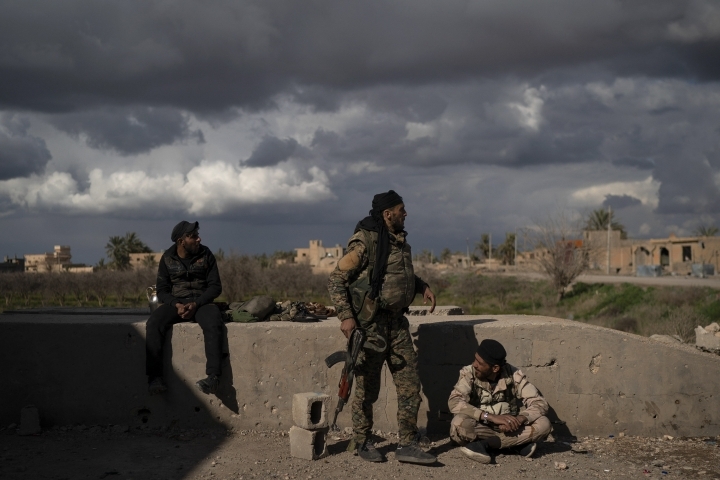 The tense standoff by the village of Baghouz is the endgame for the militant group that since 2014 controlled a vast stretch of territory across Syria and Iraq — at one point nearly from Aleppo to Baghdad — and ruled for years, aspiring to create an enduring and expanding jihadi state. The 300 militants in the pocket may include high-level figures and are believed to hold hostages. Activists said a truce in place has been extended for five days as of Sunday. A person familiar with ongoing deliberations said the group has asked for an exit through a corridor to the rebel-held northwestern province of Idlib and demand to be allowed to leave along with the civilians. The person spoke on condition of anonymity because he was not authorized to speak about the talks, which he described as taking place indirectly. The Britain-based Syrian Observatory for Human Rights, an activist group that monitors the civil war in Syria, said another request by IS to be evacuated to neighboring Iraq was also rejected. IS released 10 SDF fighters it had been holding on Sunday, but it was not clear what, if anything, the extremists would get in return, the Observatory said. Soldiers reported some of their colleagues have also been released since. The SDF appears to be aiming to wait the militants out. "They don't have supplies in the area they are in that would last for a week or more," said Baran, the commander. But DeirEzzor 24, an activist collective in eastern Syria, said several trucks loaded with food entered the IS-held areas Sunday. It also reported the release of the SDF fighters, without saying whether there was a quid pro quo. 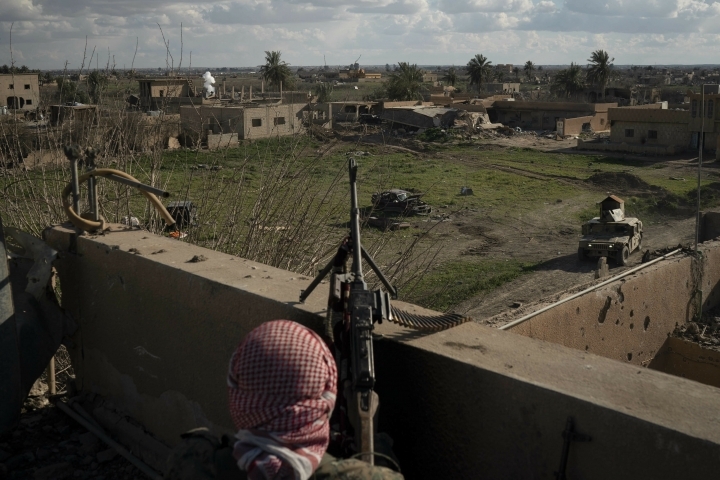 The SDF and the U.S.-led coalition have been fighting IS in the surrounding region since September. In recent years, they and other forces have steadily driven IS from nearly all the territory it once controlled, in battles that have killed tens of thousands of people and left entire towns and neighborhoods in ruins. 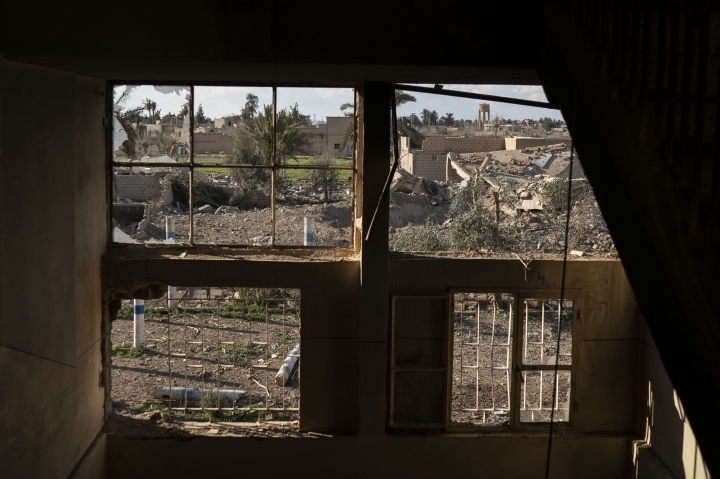 Villages leading to Baghouz lie mostly empty and destroyed, ghost towns where the only sign of life is wild grass that grew after weeks of rare heavy rain. At least 62 people have died in recent weeks, mainly from exhaustion and malnutrition, after making their way out of militant-held territory, the International Rescue Committee said. Spokesman Paul Donohoe said two-thirds were children under the age of one. He said they either died along the way or soon after arriving at a camp for the displaced. Over 30,000 people who left the last IS-held areas have arrived at the al-Hol camp in Syria's northern Hassakeh province in the last few weeks, raising the overall population of the camp to almost 42,000. 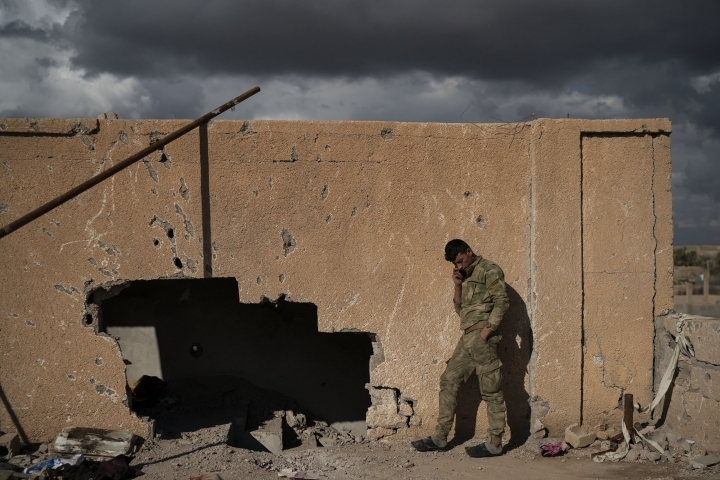 In Baghouz, SDF fighters hold a base they seized from the militants last week after intense fighting and a blitz of airstrikes. The militants appear to have used the base as a makeshift hospital. Medical supplies and medicine were strewn all over the floor. 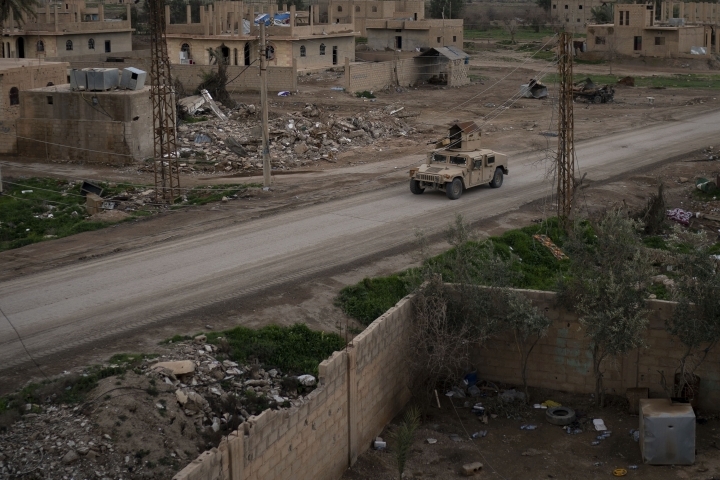 In a car outside the three-story pink building, a blank form for medical procedures was folded and picked up by an SDF soldiers. Pills, believed to be uppers, were also left in the car. In the backyard, soldiers buried two IS militants, including one who had lost a leg but continued to fight. A suicide vest still lay in the debris. Scattered in the dirt outside the building were various items left behind. The ID cards of two men from Aleppo province, including a 30-year old father of a 3-year-old; a teddy bear; and not far away a torn copy of "Milestones on the Road," a seminal book from the 1960s by Egyptian radical Islamic Sayyid Qutb that has been a major influence on jihadi groups around the world.